Want to learn about music technology and connect with industry veterans? 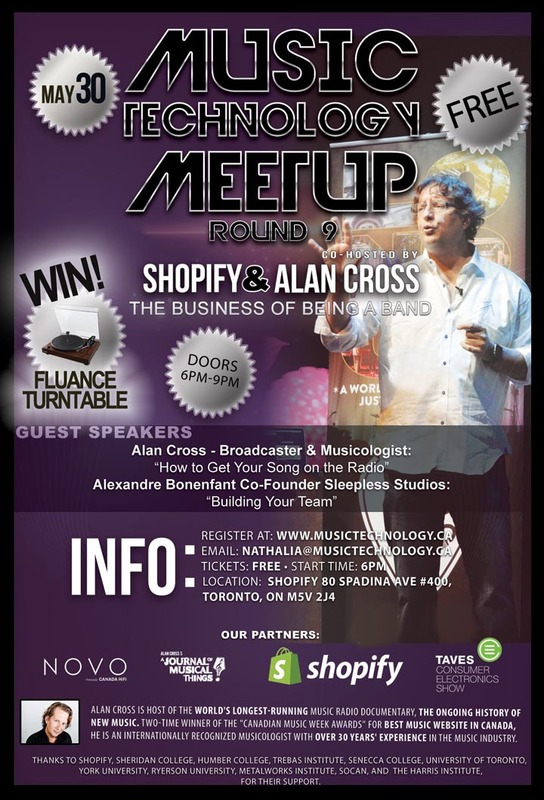 Then look no further than the Music Technology MeetUp, in partnership with Alan Cross, hosted in Toronto on May 30th. The event is free but you need to register. This MeetUp will also feature a draw for a Fluance RT81 High Fidelity Vinyl Turntable Record Player! The theme of this MeetUp is “THE BUSINESS OF BEING A BAND”. Alan Cross is an internationally known broadcaster, interviewer, writer, consultant, blogger and speaker. In his 35 years in the music business, Alan has interviewed the biggest names in rock and is a respected a musicologist and documentarian. He’s written four books, works as a public speaker, wrote a national newspaper column in Canada and co-hosted podcasts and served as head of Canadian Curation for Songza. The second speaker will be Alexandre Bonenfant founder of the Sleepless Records. Alexandre Bonenfant is a Toronto based Juno Award winning and Polaris Prize nominated music producer; engineer, recording studio owner, artist manager, and founder of the Sleepless Records. A short Q&A session will follow the presentation, so have your questions ready! Meet Josh Cook from Remix My Band! Remix My Band is a website dedicated to helping bands and artists find a remix producer that best suites the needs for any project. Location: Shopify: 80 Spadina Ave #400, Toronto, ON M5V 2J4. Date: Tuesday, May 30th.